Warning: This slide is 38'High, the second tallest Dry Slide after the Volcano River in Georgia. We could not make it any bigger for your appreciation in this graphic, nor a perfect picture to show you how big it is could be taken. Description: Our Newest Super Sized 38' 2 Lane Dry Slide is here! With the huge success of our original 36' high Volcano River and after numerous requests. 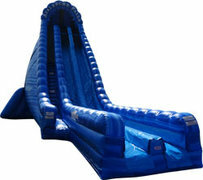 We are proud to offer the New 38' Tall Avalanche dry slide to our inventory. This is the fastest dry slide we have ever offered.